Hi everyone! I always post my curriculum for each year prior to the start of our school year. But I’ve had some requests to post our curriculum choices by grade level to help out people trying to choose curriculum for a certain year. I thought that would be a great idea, and if it helps you all out then double yay! I’ll be starting this week with our preschool homeschool curriculum choices, and going up through the grades each Monday. Please keep in mind that students and parents needs will differ, so what we’re comfortable with may not work perfectly for you. So I’m hoping you’ll just use this as a guide to help you get started in picking your curriculum. And hopefully take my choices as helpful suggestions, not what you absolutely have to do. Large motor skills: Outside play, dancing, etc. Math skills: counting, one-to-one correspondence, size sorting, least/more/most, etc. If you’ve been following me for awhile you know that I came out with my Preschool Letter of the Week curriculum several years ago. I’d been searching for something more fun and hands on to do with my preschooler, while still teaching the basics to get her ready for kindergarten. I couldn’t find what I was after, so I created the Letter of the Week. It’s a 26 week preschool course designed to give your student a head-start on preparing for kindergarten. 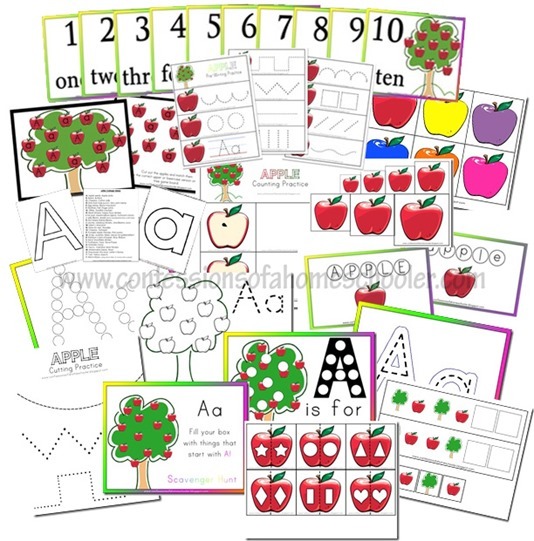 It’s full of educational activities that focus on the letter recognition, sounds, number recognition, counting, basic math skills, pre-writing practice, and all the necessary fine-motor skills that will be required for your preschooler to be ready for kindergarten! I also created daily lesson plans to make it easier for you to follow along with. So of course for my main preschool choice, I suggest the Letter of the Week preschool curriculum. There are also additional optional suggested items that we used with it as time allowed. Art: World’s Greatest Artists Vol. 1. I also include plenty of free time art projects, play-doh, painting, drawing, pastels, etc. I love the Home Art Studio DVDs they have really fun art projects by grade level. I also love the Deep Space Sparkle website, she has tons of free art ideas for kids also sorted by grade level! P.E. : Family Time Fitness or just add some daily outside playtime to your schedule! Head to the park, go on a walk or bike ride, play kick ball, ride scooters, etc. Read together often! We like to head to the library and get fun books to read together. I also have an A-Z reading list in the Letter of the Week curriculum that you are welcome to use as a guide. If your preschooler is your oldest student I would suggest keeping things simple. You could always start out with the Letter of the Week activities and add in anything you feel like your child is ready for as you go. But make your days fun and engaging, avoid boring worksheets there will be plenty of those later on! If your preschooler is not your oldest, I suggest incorporating them into your older students studies wherever possible. For example we all do science experiments together, or history projects. We also like to do read-a-louds together, Bible studies, and art projects. Of course I don’t expect my preschooler to write a report on ancient Egypt, but they can certainly participate in an Egyptian Mummy Experiment, build a 3D Rainforest Diorama, or work on the Roman Colosseum ! If my Letter of the Week is too much printing & preparation for you, go for something easier. There are plenty of pre-printed preschool level workbooks out there that you can use as a supplement to your learning. I would just make sure to take it easy on the worksheets and make sure to intersperse them with other more engaging activities. There will be plenty of time for your student to sit at a desk doing worksheets when they’re older! Make sure to add in a variety of activities each day to cover the basic skill sets, work their fine motor skills, logical/problem solving skills, and creative thinking and imagination and you’ll be all set! And make sure to have fun! If you’d like to make up your own preschool curriculum I also have a ton of free preschool printables you’re welcome to use! When preparing your curriculum for preschool I think the best advice I can give you is to keep it simple and engaging. Pick lots of hands-on fun learning, and get them excited about school. There’s a huge push right now to learn more and more, faster and sooner. Unfortunately I think it’s creating a certain level of stress on parents and students both. Kids aren’t as excited about learning and honestly after watching my own kids grow and learn, I don’t think this aggressive stance is beneficial in any way. All of my kiddos have picked things up as they were ready for them. I hasn’t mattered how early I started them, or how hard I pushed. So keep preschool fun! 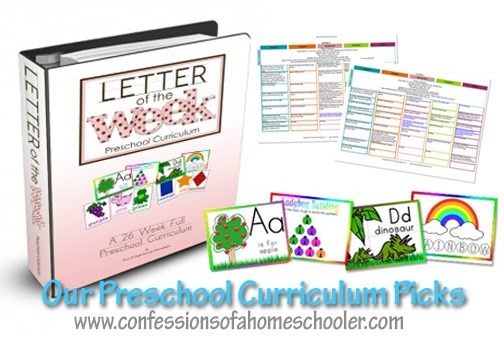 I hope this has helped you in planning your homeschool curriculum for preschool! This is very helpful. Thank you. My oldest is 4 and loves your LOTW. We are slowly working through it. He’s also doing a few apps and loves the Leap Frog series (thanks to Netflix). We do puzzles, play Go Fish and Uno, Connect 4, etc. I always wonder if we’re doing the right things so seeing your list as a more experienced homeschool mom definitely helps me know we’re on the right track. Erica, Thank you so much for your LOTW curriculum! I used it with my Little Lady in PK last year and also used some of the K4 materials this year! It really helped guide our year by doing a letter each week and then piggybacking off of that letter for reading, writing, science, etc. Thanks for all of your materials–they really helped jumpstart our homeschool experience! Is it too late to receive the prek journal free with the purchase of the prek curriculum? If you purchased the LOTW there is a coupon code to download the daily learning notebook free in either your lesson plans or in the LOTW_PREP_INSTRUCTIONS.pdf depending on when you purchased. Thank you! I have twin toddler ps and an almost 1 year old. They love to learn but I cannot always think of what to teach them. You inspired me to homeschool preschool! I am making a simple 9am-noon schedule right now! Hello, I purchased your k4 kindergarten for my daughter only to realize, we should probably work on the LOTW version. I have been printing it out at home and found that it uses quite a bit of ink, Is there a book version I can buy? Unfortunately I don’t sell my curriculum in printed format at this time. However I do recommend http://www.thehomeschoolprintingcompany.com as they offer really inexpensive printing. Yes, Letter of the Week 🙂 You can find it in my store! My name is Erica too and I ALSO capitalize the R when I write out my name!! How funny is that?! I’ll be doing some basic homeschooling for my toddler this year – thanks for the tips! !